The ROARING 20s - first age of youth culture. Celebration of life - why? after so much death, people were drowning out all of the loss with celebration. This was also the era of the gangster and the speakeasy, of jazz and swing, of radio and movies. Mass entertainment started to spread mass culture worldwide. 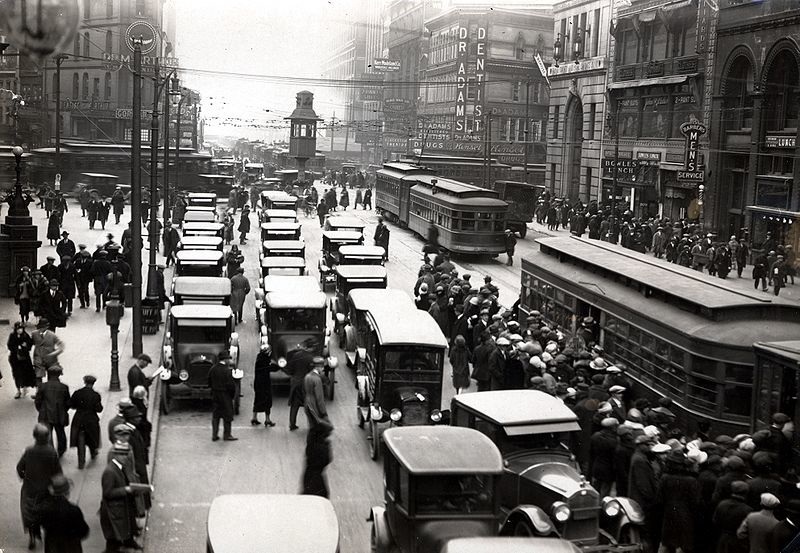 The roots of today's globalization may be found in the 1920s. The American economy was undamaged by the war. Indeed, its ability to produce goods had expanded because of the war effort. As industry returned to making peacetime goods, mass production let Henry Ford roll out the Model T and make this the first era of the family car. The family car gave mobility to the masses. People started to live farther from work. Cities sprawled into the suburbs. Young people could escape the supervision of their parents. Families vacationed farther from home than ever before. The oil and gas industries grew to supply the increasing numbers of automobiles. Generally, industry produced more goods, such as the first refrigerators and automatic clothes washers, and consumerism grew in the prosperity of the 1920s. Prohibition came into force in 1919 and lasted until 1933, but it didn't stop most Americans from carrying on the post-war party. Prohibition had to be one of the most ignored laws in history. A whole sub-culture developed around avoiding the law. Prohibition made this period the age of infamous bootlegging gangsters like Chicago's Al "Scarface" Capone and federal agents like Elliot Ness and his Untouchables, who tried to shut Capone down. In Canada, the export of alcoholic beverages was legal, so Canadian fishermen, businessmen and gangsters made money rum-running to the United States. The smuggled booze was sold in illegal nightclubs called speakeasies. Live bands, in clubs like Harlem's legendary Cotton Club, played jazz and swing while flappers sipped bathtub gin and danced the Charleston into the wee hours of the morning. Less glamorous. The 1929 Stock Market Crash. They call the 1930s, The Dirty 30s. The decade was characterized by unemployment, the search for work, labour struggles and generally hard times for the common person. Soup kitchens and bread lines created a lasting image of the time. Governments everywhere struggled to cope with the crisis. Most introduced some form of welfare benefits, commonly referred to as relief or the dole. In America, President Franklin Delano Roosevelt's New Deal created jobs with a series of huge, publicly funded make-work projects. In Europe, the economic problems of the 1930s helped bring the Nazis to power in Germany.